Preheat oven to 375°. Cut squash in half lengthwise and scoop out seeds. Lightly coat with olive oil, place on a foil covered sheet pan and roast until soft, about 30-40 minutes. Sauté shallots and garlic until softened. When squash is cool, scrape out flesh and mash in a medium sized bowl. Add shallot mixture, water chestnuts and parmesan. Season to taste with salt, pepper and lemon juice. Bring a large pot of salted water to a boil. 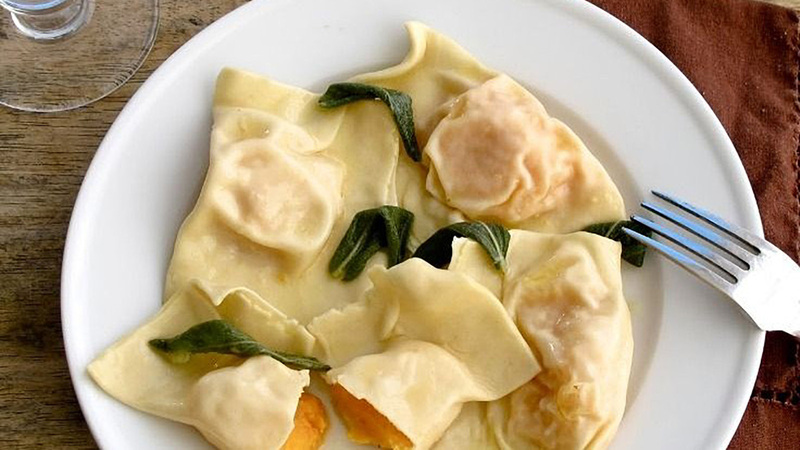 Lay out the pot sticker wrappers and brush with the egg wash. Place a generous tablespoon of the squash mixture in the middle of each wrapper and cover with a second wrapper. Press closely around filling to seal. Trim as needed, and then cook at a low boil to al dente, about 2-4 minutes. Drain and toss with olive oil to prevent sticking. Heat 1/8” of olive oil in a small pan until very hot. Test the heat with a tarragon leaf, it should sizzle immediately. Fry herbs until crisp and drain on a paper towel. Add butter to the olive oil and cook until browned. Pour over ravioli and toss to coat. Add pine nuts, parmesan and parsley.